Rotating Light | Alpine Products, Inc.
7-1/4″ H x 4-3/4″ W base diameter. Electronics: All solid state circuitry. Operating Range: Outside temperature range between -50 degrees F. and 140 degrees F.
Stationary bulb has rotating reflector at 150 rpm. 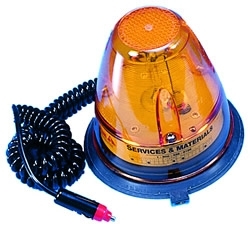 Rotating reflector is driven by a 12 volt D.C. motor. All units furnished with magnetic/suction pad base. Permanent mount light available.